Amazon Great Indian Festival Sale 2018 starting day is 10th October and end on 15th October. As every year on occasion of Durga Puja & Diwali amazon come up with great offers, Discount & Cashback. This year Amazon Great India Festival Sale 2018 has a very exciting instant cashback offer on SBI debit or Credit card. 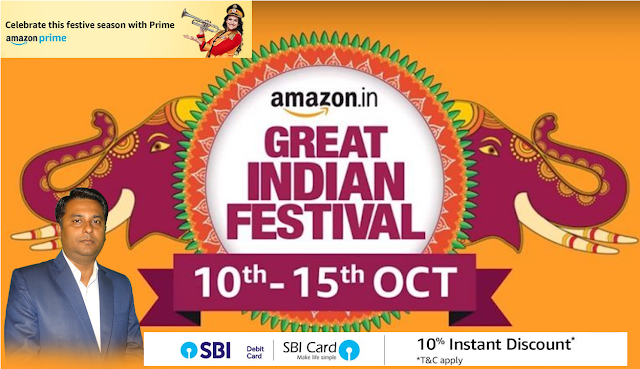 For Amazon Prime member great Indian festival sale will be starting on 9th October at 12 noon. So the amazon prime members can early excess all the exciting deals of amazon great Indian Festival sale. Enjoy huge discount & saving on mobiles, laptop, TV, Clothing, home furniture & decor, electronics, mobile accessories and more. So if you planning or in mind to buy anything in this festive season must visit on Amazon.in for the exciting deals on this great Indian festival sale. Get a great deal on clothing and fashion for men and women wear. Enjoy Up to 90% off +15% Cashback on this festive sale on Amazon. For further more information on Amazon Great Indian Festival Sale 2018 which is going to start from 10th October to 15th October) can be seen in this video. Let us know about this article “Amazon Great Indian Festival Sale 2018: Offers, Discount, Instant Cashback, and No Cost EMI ” and please comment your views and thoughts too. Also please do visit our youtube channel and subscribe our channel Sab Kuch Online for more informative video.